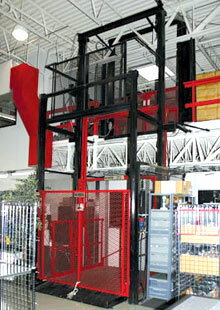 Vertical lifts assist in moving loads between floors. They can be installed in new or existing buildings to improve space utilization. You may have the lifts designed for through-floor, multi-story or mezzanine applications. Most lifts are capable of moving up to 200,000 pounds at a time and come in various sizes to fit the commercial need. Vertical lifts, also called Vertical Reciprocating Conveyors or by the acronym VRC, are often the safest way to move large and non-palletized loads between floors. They are often misnamed but known as freight elevators. Autoquip is one of the trusted companies that we use to supply our lifts. They offer both single and dual ram lifts. Their state of the art engineers and quality workmanship guarantee an exceptional product for your industrial or commercial facility. For many years we have distributed Pflow vertical lift products. Pflow are devoted to the design and manufacture of safe, vertical material handling equipment. Their product line includes automated and custom lifts , and have mechanical, hydraulic and package handling lifts in various sizes. We also sell, install and service Wildeck VRC’s as another vertical lift solution. Vertical Conveyors, also called VRC’s or Vertical Reciprocating Conveyors, move materials in warehouses, loading docks, factories, industrial plants, storage facilities or anywhere that products need to move vertically from one level to another. A Rail Lift is suitable for loading dock and warehouse facilities that lack the space for a conventional dock lift. They are easy to relocate and install quickly. Rail lifts are a cost-effective, powered loading dock solution when a surface-mount lift is required. Call a McKinley Equipment vertical lift solutions expert to determine the best lift for your needs. We also offer installation and repair service for all brands of freight lifts.